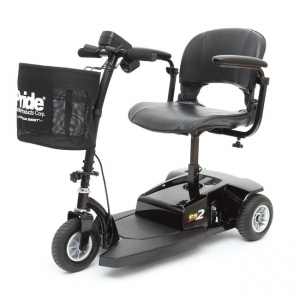 The Pride Go-Go ES2 3-wheel travel scooter provides durability and increased portability with an industry-proven drive system and design. Perfect for someone looking to find exceptional value at an entry-level price, the ES2 is simple for first time users. The straight tiller design with the foldable, molded seating system *does not swivel puts you in position to easily maneuver your scooter both indoors and outdoors. There are only two speed settings on the ES2, high and low, which provides clarity to novice users. Features such as the non-marring tires and the removable fabric front basket are often overlooked but add quality to this mobility vehicle.